SO much has happened and i'm not sure how to say it all. I've been to something called an "Unformal settlement." Which basicly means the slums. These houses are made of sheet metal and rock. There is nothing. No runinnig water, no toilets, nothing but the dirt and the tin. These people live in these slums and then go into the city to work. Most of them do not have a job by the standards we hold. The sell items on the side of the street to passing cars. They walk among the cars at stop lights trying to pedal things like soda, wooden bowls, even a world map or globe. Seeing this place has really weighed on all of our hearts. We're completely taken aback by the unbelievable poverty that we've seen here. But equaly as stunning is nearly the same side of town has a huge mall that houses hundreds of the worlds top brands of materialism. Sadly that's where i am right now. The only place that i could find internet. 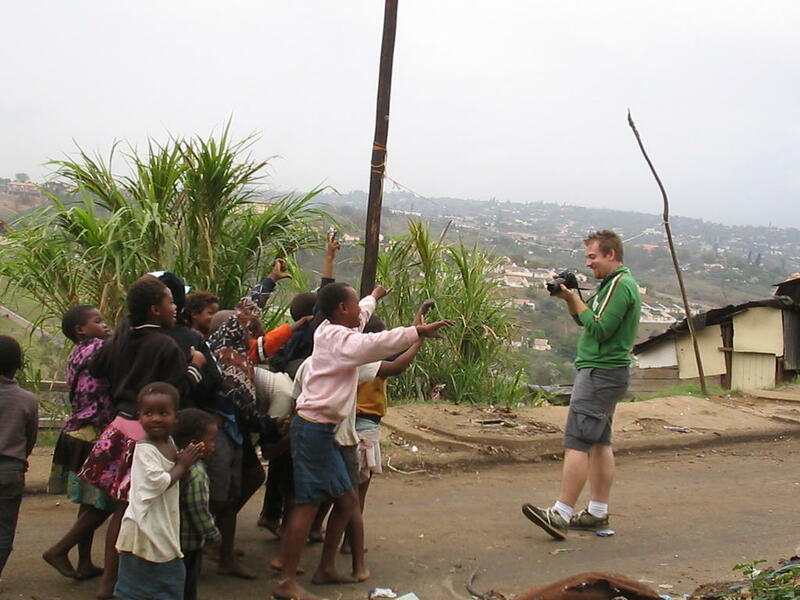 Here is a picture that Chris took at the settlement of some of the children and I. I was trying to get them to sit still so i could fit them all in the shot. But I made the wonderful mistake of showing them the preview screen with their pictures on it so they all run after me to see the show. This picture makes me so sad and yet i was laughing and enjoying myself the entire time. There are many more pictures of this village to come; I don't have them with me right now. On the other side of town we had to do our jobs as international professionals. We went to a radio interview for the one and only christian station in town. It was a far change from the place we had been the day before.